“If I had to classify fly fishermen, I should place the grayling fisherman in the first rank, then the trout fishermen of the chalk streams and, finally, the trout fishermen of other rivers”. 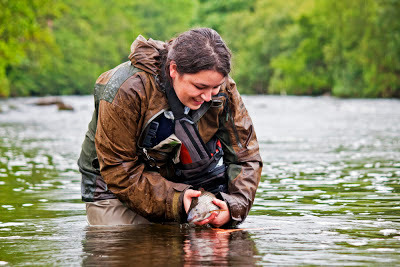 The first fish I ever caught was a grayling. I was maybe four, five, six or seven years old. I remember it well. My father had placed me on a wooden footbridge on the River Itchen. I was using the same rod he used as a boy and I had been told to be careful with it. He had tied on a Butcher for me; it’s an old fashioned sea trout fly tied with silver, black and red. I let my line float down stream and watched it glint amongst the emerald floating blankets of weed. I felt the fish take the hook. I remember my parents telling me to keep my rod up as I played it. I remember feeling really pleased with myself when my father netted it. It was my fish. My first fish and I had to eat ti and so it was duly despatched and barbecued the next day. I caught a really big grayling this season. I’m not normally one for boasting because I struggle sometimes with people who do because I don’t often believe them. I’ve broken all my own rules as I have been telling everyone I know how big it was. I don’t expect you to believe me. For all its size it was an easy fish to catch. After a gentle take and a hard, long fight in a fast current my father was able to net it into my inadequately sized scoop net. He also measured it. It was 21” long. Another big grayling. I caught this on the Eden with Mr Chips and NCA. It was a hard earned fish on a difficult and hugely wet day. In this instance, I remember the fish less and the fishing more. I had been guided skilfully all weekend and had failed to catch a fish. In the fading light NCA and I spotted the fins and tails of an active fish in a steadily rising river. I sneaked a cast up to it and uncharacteristically didn’t bottle it and miss the rise. Strangely, this grayling felt like a big trout it felt shakier on the line than it should. When I caught it, I could have have been a little disappointed, I was after one of the famously vicious Eden trout. I couldn’t have been more pleased and neither could have my companions. It had really been a team effort to get this rather shoddy fisherwoman to catch something. I admit that I have been known to target grayling with the express purpose of removing them (but not killing them) so that I can get at a prized trout. It rarely works. On the whole I don’t like catching grayling, they feel too precious somehow. When they are young, they feel so skittish and flap so much it’s a bit like catching a pretty moth and trying to release it outdoors without crushing its wings. When grayling get large and old, they shoal up together like war veterans in a rest home. I can’t help but think they deserve their peace. I’ve been trying to express how odd grayling are. They are wild and precious but can be annoying getting in the way of catching their flashier, blonder cousin the trout. To look at they appear to be at once ridiculously delicate but also solid and steady. Grayling have many shades, they are hard to explain or understand. Perhaps, this is why, piscatorial gentlemen of yore called them ladies. The title of this post was courtesy of Philip Miles. Top photograph and grayling caught and photographed by Dave Smith. Bottom Photograph by Matt Eastham. All hold copyright of their words and images.